We are a family company taking pride in giving friendly, personal service and in going the extra distance. The result is a big percentage of repeat customers and many happy long term storers. Good service is just a phone call away – we can help plan your move, arrange movers, assist with the calculation of storage space requirements and can book space ahead free of charge. We have many commercial customers storing a wide range of goods- business records, imported, surplus clearance and trading stock. Parking is ample in a cul de sac with very good truck access. Room for container unloading or packing (MAF approved). Learn more on Self Storage for Business. 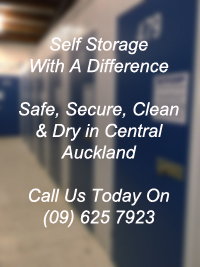 We can arrange your move within Auckland and to all parts of New Zealand or overseas. Learn more on Self Storage for Household and Families. We have many customers who are second and third time storers (see our client referrals). Learn more on Self Storage for Students.